In the last 48 hours, I've gotten a lot of questions regarding the best way to transition from chemically relaxed hair to natural hair. There are so many options available-- weaves, extensions, wigs, the "big chop"... Ultimately, you'll have to choose the option that best suits you. But whichever option you choose, be sure to remember this-- just because you decide to put your hair "out of sight" for a couple of months (ie. under weaves, wigs, or extensions), it doesn't mean that you can put it out of mind. Many women are devastated, when after wearing weaves and extensions for years, they only get to enjoy their hair growth for the 2 minutes it takes for the stylist to towel dry their hair. Why? Because they didn't take care of their own hair while it was hidden away, and now, they have to cut 1/2 of it off, due to split ends and breakage. So sad... especially for those of us whose hair seems to grow very slowly. I can only imagine the cries of despair. "But it took me forever to get it this long!" "Please let me look at it a little while longer. Can someone please take a picture with my camera phone?" Your hair is an extension of your skin. And what happens to your skin if you don't take care of it? It dries up, wrinkles prematurely, and can become scaly and unsightly. Eww! How many of you have walked by someone, looked at her skin and thought, "Mm. If only it wouldn't be classified as assault for me to run up on her, and moisturize those elbows". Well, even if you haven't had that experience, I know you've passed by someone, looked at her hair, and thought, "Mm. If only I could take some scissors to those last 2 inches, she would look so much better". And God forbid that someone may be saying these things about YOU! Don't get them put in too tight- If you have a headache after your hair is done, that is a sign that your weave or extensions are too tight. If you have a resilient head of hair, you may not experience any damage. But if not, you may find that your hairline starts receding over time. 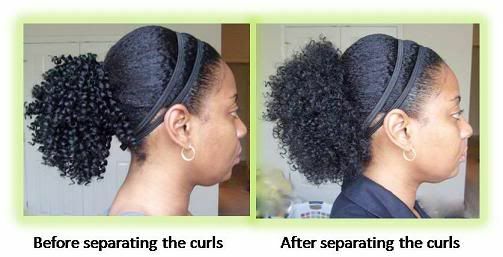 It is much easier to prevent traction related hair loss from happening in the first place, than it is to renew hair growth after the damage is doneClean your scalp- Even if you can't wash your scalp regularly while wearing extensions or a weave, there are many useful alternatives for the interim. 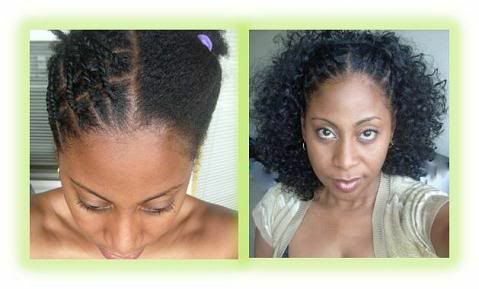 Using a cotton swab, moistened with Witch Hazel (a natural astringent) to clean the scalp, is one of those alternatives. Product build-up over time can choke the scalp, and lead to slowed hair growth, hair loss, or lackluster hair. So be sure to clean that build-up away. 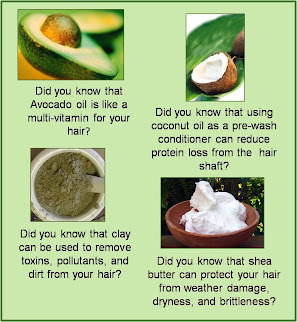 Moisturize your hair and scalp- But whatever you do, don't slather your scalp or hair with petroleum or mineral oil based products ("paraffinum liquidum" is another name for mineral oil, by the way). These oils can clog the pores on the scalp and skin, and trust me-- you don't want to trap anything in there that needs to come out. It's hard to find commercial products without these 2 ingredients, so if you MUST use them, choose products that list them near to the end of the ingredient list. In most, if not all, cosmetic products, ingredients are listed from greatest to smallest (Keep this in mind, when an expensive hair lotion/cream starts with "water"- more on that later). Alternately, you can go to Whole Foods, Trader Joe's, and some general supermarkets, and buy coconut oil, avocado oil, or olive oil. These oils penetrate the hair shaft, especially with heat, so they go beyond just making your hair look healthy-- they actually get inside of the cuticle, coating and moisturizing your hair from the inside. Drink plenty of water- Your hair doesn't only need oils. It needs water, too. If your body is dehydrated, your hair is really going to be dehydrated. Your body is a fine tuned machine. If you need hydration, it's going to draw water from the non-critical areas first. I'd hate to see you lose those locks! Proper hydration is also needed for proper circulation. Your blood is rich with oxygen and nutrients to nourish all parts of your body, including your scalp. So help keep those nutrients flowing. If you don't eat a lot of naturally wet fruits and vegetables, or drink sugarless teas, guzzle at least 64 oz of water per day. Be gentle when you take them out- When you take a weave or extensions out, shift your thinking from "fake hair" to "my hair". You can't tug, yank, and rip on your own hair, the way you might do with an unruly weave track. If you get a knot in your weave, you can just rip it out. But if you rip your own hair out, good luck sewing it back in. Use a wide-toothed comb to undo your tangles. And if one particular knot doesn't respond to combing or conditioning, then part ways respectfully. Cut that bad boy out. At least you won't be left with straggly, split ends. Choose simpler/healthier alternatives- My preferred mode of hair transitioning is via the use of 1/2 wigs or drawstring ponytails. I am the QUEEN of fake hair pieces. One of my hair containers busted open when I was moving once, and my friend referred to them as hamsters. I've got hair pieces coming out of my ears! The benefit of using one of these easily removable pieces is exactly that-- they're easily removable. Your scalp can breathe more, and has more access to sunshine, because more of it is exposed. They are also much less expensive than a weave, because you slip those jokers in and out ALL BY YOURSELF. And because you don't sleep on them, they doesn't get messed up as quickly. Holler! And if those styles fail, there's always the faux "Fro-Hawk", like the one I'm sporting at the top of this page. But of course, the easiest option of all is none other than.... the BIG CHOP!!! Just cutting all of the relaxed hair off, and basking in your natural glory, is probably the most liberating choice of them all. But since everyone is looking for something different during transition, be thoughtful, and choose what works best for you. I certainly do! Thanks for sharing. I wore a press and curl for 3 months. I wish I knew how lovely this product was before I gave in and got a perm. So many great professional options. This is exactly the kind of blog I've been looking for. Hair experiments from a real person with pictures to show! I had the most beautiful curly hair and of course what did I do, I listened to a "curly hair expert" hair dresser who told me to use a light relaxer just to relax the curls and make them more defined. Anyhoo, it was cute the first day, dry the next week and splitting a few week after that. Needless to say I haven't had the courage to chop it all off and start fresh. But now that I have found this site, I have so many glamorous options. Thank you Karen! what brand of pony tail is this?? In "Transitioning Is An Art- Part II", the brand/style of the hair piece is listed. Good luck!